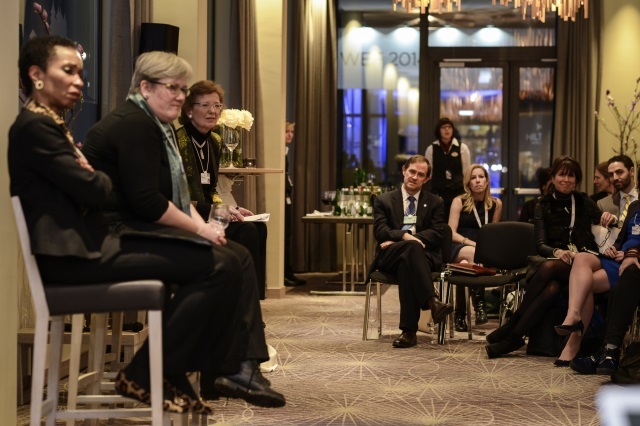 Mary Robinson was joined by Christiana Figueres and Kathy Calvin for a discussion on the role of women leaders in climate change to be held during the 2014 World Economic Forum in Davos, Switzerland. On 24 January Mary Robinson was joined by Christiana Figueres, Executive Secretary of the United Nations Framework Convention on Climate Change (UNFCCC) and Kathy Calvin, President and CEO of the United Nations Foundation, for a discussion on the role of women leaders in climate change to be held during the 2014 World Economic Forum in Davos, Switzerland. ‘Women Leaders for Climate Justice: Mobilizing Action on Climate Change by Women Leaders in Advance of September 2014’ aimed to engage women leaders on the human rights dimensions of climate change negotiations ahead of the Leaders’ Summit, to be hosted by United Nations Secretary General Ban Ki-moon in nine months’ time.